It’s getting colder in the Netherlands, sadly since I really can’t say goodbye to summer yet. Luckily, food is there for comfort and this dish is one of them. One of my favourite waffle ingredients has to be sweet potato. It has the perfect colour, taste, and texture to make a good waffle mixed with different kinds of ingredients. For this dish, I added cheese & sauerkraut to it. Serve this dish with a nice beef stew with lots of gravy for a fulfilling dinner. And it’s super easy. In a bowl mix together all the ingredients till you get a firm dough. Heat up your waffle iron and bake a generous tablespoon of batter for one waffle. 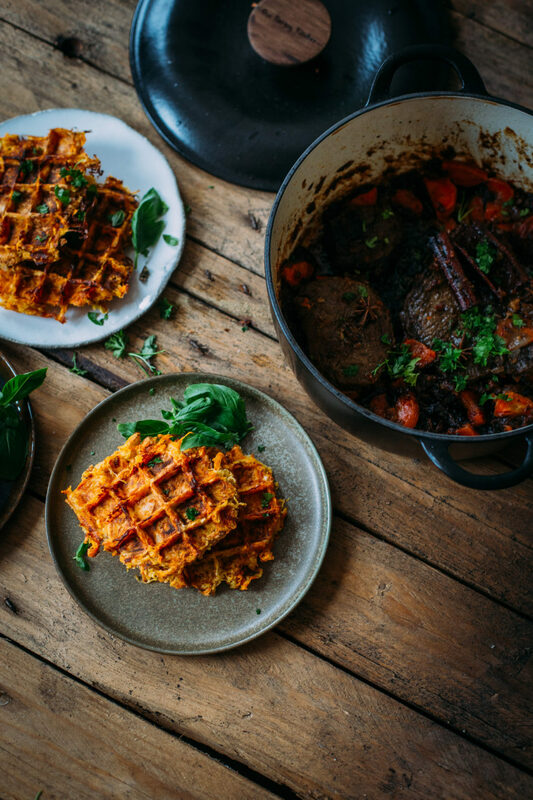 Serve the waffles warm with a good stew and you’ve got an amazing dinner for your family/guests or all for yourself. Enjoy!